Good news, everybody! In Chrome 61 for Android, we've launched the navigator.share() method, which allows websites to invoke the native sharing capabilities of the host platform. This method, part of the simple Web Share API—written by Matt Giuca on the Chrome team—allows you easily trigger the native Android share dialog, passing either a URL or text to share. This is an important API as it gives your end-users user control of how and where the data is shared. The Web Share API is a Promise-based, single method API. It accepts an object which must have at least one of the properties named text or url. Once invoked it will bring up the native picker (see video) and allow you to share the data with the app chosen by the user. Santa Tracker is a holiday tradition here at Google. 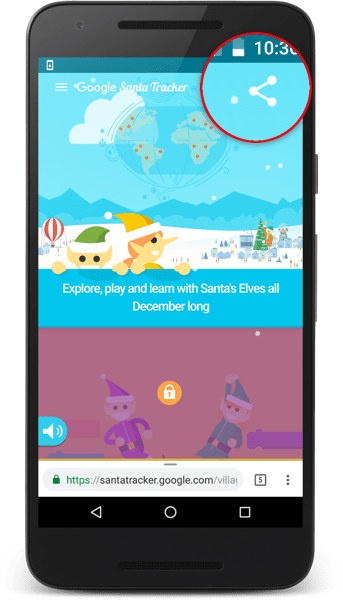 Every December, you can celebrate the season with games and educational experiences: and in the new year, Santa Tracker is open-sourced and delivered. In 2016, we used the Web Share API on Android via an Origin Trial (note: this is not required to use the Web Share API now, as part of Chrome 61). This API was a perfect fit for mobile—in previous years, we had disabled share buttons on mobile, as space is at a premium and we couldn't justify having several share targets. With the Web Share API, we were able to present just one button, saving precious pixels. We also found that users shared with Web Share around 20% more than users without the API enabled. The Web Share API was originally launched as an Origin Trial as part of Chrome 55. In the future, websites themselves will be allowed to register themselves as a "share receiver", enabling sharing to the web—from both the web and native apps. We are on the Chrome team are incredibly excited by this.